DENVER, Colorado (CNN) -- Sen. Barack Obama laid out his plan for change in America as he accepted the Democratic presidential nomination Thursday night, securing his place in history as the first African-American to lead a major party ticket. 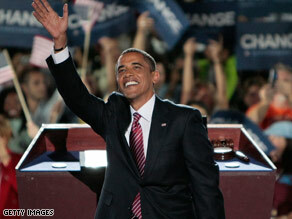 Sen. Barack Obama accepted his party's nomination for the presidency Thursday night. "Change happens because the American people demand it -- because they rise up and insist on new ideas and new leadership, a new politics for a new time. America, this is one of those moments," he told supporters at the Democratic National Convention. "I believe that as hard as it will be, the change we need is coming." Obama pitted himself against John McCain, repeatedly countering attacks from his Republican rival while casting the election as a choice between change and failure, as he addressed tens of thousands of cheering people and millions of primetime TV viewers. McCain would continue the policies of the Bush administration, Obama said. "We are here because we love this country too much to let the next four years look just like the last eight. On November 4, we must stand up and say: 'Eight is enough,' " he told the Denver throng. "He said that our economy has made 'great progress' under this president. He said that the fundamentals of the economy are strong. And when one of his chief advisers -- the man who wrote his economic plan -- was talking about the anxiety Americans are feeling, he said that we were just suffering from a 'mental recession,' and that we've become, and I quote, 'a nation of whiners,' " Obama said, eliciting boos from the crowd. By early evening, the line of people seeking to get into Invesco Field to hear Obama's address stretched for six miles, and the crowd that filled the stadium was more than 80,000 strong. In a statement issued immediately after the speech, the McCain campaign called the speech "misleading" and said it was "fundamentally at odds with the meager record of Barack Obama." "It was an excellent home run," said Matt Besser, an Obama representative to the DNC platform committee. "He did everything he needed to do. He gracefully dissected John McCain and then set out his own vision, and clearly everyone got it." The scene was much like a rock concert, with the foot-stomping, flag-waving crowd dancing and bouncing beach balls as they awaited Obama's arrival. When Obama officially locked in his party's nomination on Wednesday, delegates sobbed, cheered and hugged in celebration of the historic moment. The Democratic candidate's address fell on the 45th anniversary of the Rev. Martin Luther King Jr.'s "I have a dream" speech. In an emotional tribute to the slain civil rights leader earlier in the evening, King's children paid respect to their father and said he would have been proud of the party and the generation that would realize his dream. Civil rights hero Rep. John Lewis and Rep. Jesse Jackson Jr., son of civil rights leader Jesse Jackson, were seen hugging each other and weeping. McCain also honored Obama's achievement in a television ad that aired during the convention. "Eight years ago, some said there was not much difference between the nominees of the two major parties and it didn't really matter who became president," he told delegates. "But here we all are in 2008, and I doubt anyone would argue now that election didn't matter," he said. Next week, it's the Republicans turn. Their four-day convention gets underway Monday in Minneapolis-St. Paul, Minnesota.